The Emmy's might be over, but our awards season has just begun. Axiom has 14 finalist entries in the BMA-Houston Awards this month. The BMA Lantern Awards celebrate top-quality creative and strategic business-to-business communications. Here are just some of the projects that were named as a finalist. As a Houston marketing agency in its 20th year of business, Axiom’s no stranger to awards shows. But this year is special. This year marks the 30th anniversary of the Lantern Awards – a great milestone that naturally aligns with our own anniversary. The 30th Annual Lantern Awards Gala Exhibition & Awards Dinner is scheduled for Thursday, November 29 at the House of Blues Downtown Houston. If you want to see pics from the event, be sure to follow us on social (links at the bottom of this post). All of Axiom’s nominated pieces will be displayed in the Winner’s Gallery – and even have a chance at being named the People’s Choice award. We’ll report back after the awards ceremony with the results of the show. If you’d like to attend the Gala, tickets are available on the BMA Houston website. 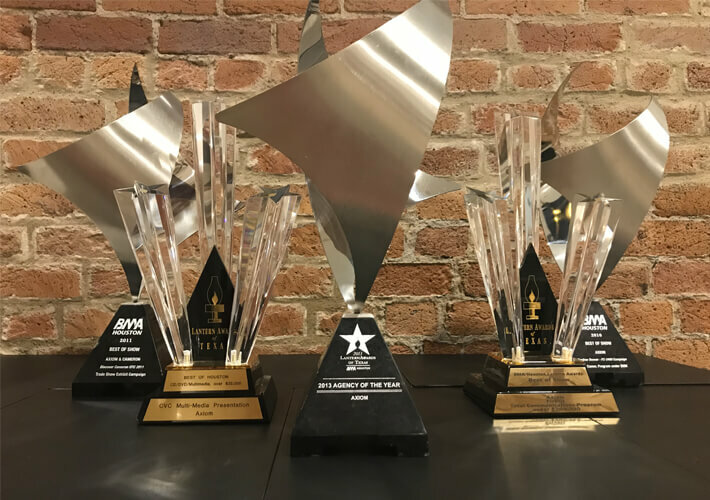 Until then, we’ll just leave you with some of the Houston marketing awards we’ve won over the years.